This claim was supported by an unusual measured property, the electron density ρ(r) and its Laplacian in the putative O…C region. These two properties are one of those (relatively rare) meetings between experiment and quantum mechanics, and their usefulness has been noted in this blog on previous occasions. However, note that in this designed structure, the O…C distances are merely 2.65-2.7Å, significantly longer than in solid carbon dioxide! So carbon dioxide, in a form many of us are familiar with (solid), can certainly be justified as being described as having a hexacoordinate carbon (although we might draw the line at describing it as having hexavalent carbon). If oxygen atoms can approach the carbon in CO2 to within ~2.4Å, an interesting question can be posed. How close can another carbon get to CO2 without actually reacting and forming a new molecule? C-C bonds, even weak ones, are so much more interesting than C-O bonds! It would have to be a particularly nucleophilic carbon, of course. A search of the August 2010 version of the Cambridge structural database (CSD) reveals no really close approaches of another carbon to CO2. Only about 8 weak examples are found, and here the C-C distances are ~3.0-3.2Å, with the O=C=O angle in the CO2 never less than 170°. In this context, there is an intriguing and very recent report (which has not yet made it into the searchable CSD) of the structure of CO2 trapped in a cavity next to what was claimed to be a molecule of 1,3-dimethyl cyclobutadiene, or CBD (see 10.1126/science.1188002 and the discussion of this article in my earlier blog post). The focus in that report was on the “Mona Lisa of organic chemistry”, namely the CBD unit. One feels that the structure of the adjacent CO2 was of lesser interest to the authors. 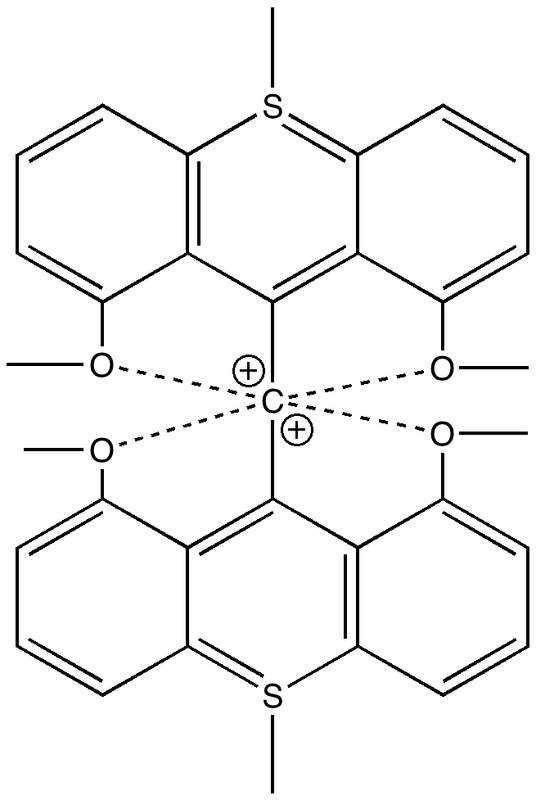 According to a visual image of this system, the CBD and CO2 pair show quite an intimate approach via their carbon atoms (a ghostly C-C bond is clearly represented). This raises the interesting question of whether the description of this pair should be of two intimate but nevertheless separate and relatively unperturbed molecules not connected by a covalent bond (“more indicative of a strong van der Waals contact than of covalent bonding“) or of a pair fully bound by a covalent C-C bond between them? The issue of what is an interaction, and what is a bond continues to raise its often controversial head. And quantum theory continues to provide a multitude of interpretations as well. This entry was posted on Friday, September 17th, 2010 at 3:55 pm and is filed under Hypervalency, Interesting chemistry. You can follow any responses to this entry through the RSS 2.0 feed. You can leave a response, or trackback from your own site. 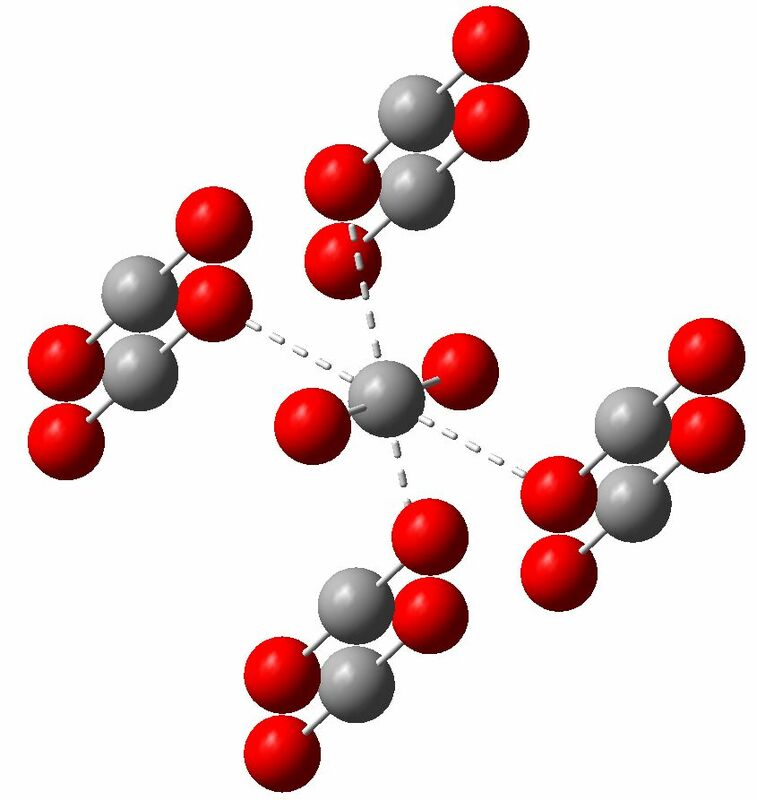 I note here two recent publications (doi: 10.1073/pnas.1118791109 and 10.1103/PhysRevLett.108.125701) where the structure of carbon dioxide at very high pressures has been solved (CO2-V). It contains tetrahedral CO4 units with no remaining C=O double bonds.